Whitcomb & Shaftesbury, the fabulously good value tailor I have written about recently, visit the US 5-6 times a year. They will be there next in a couple of weeks – in New York for three days and then Los Angeles for one. Email karen@whitcombshaftesbury.com for appointments. Prices start at $2100 for a 2-piece suit under the Classic Bespoke process I have written about, and $250 for shirts (both ex-VAT). 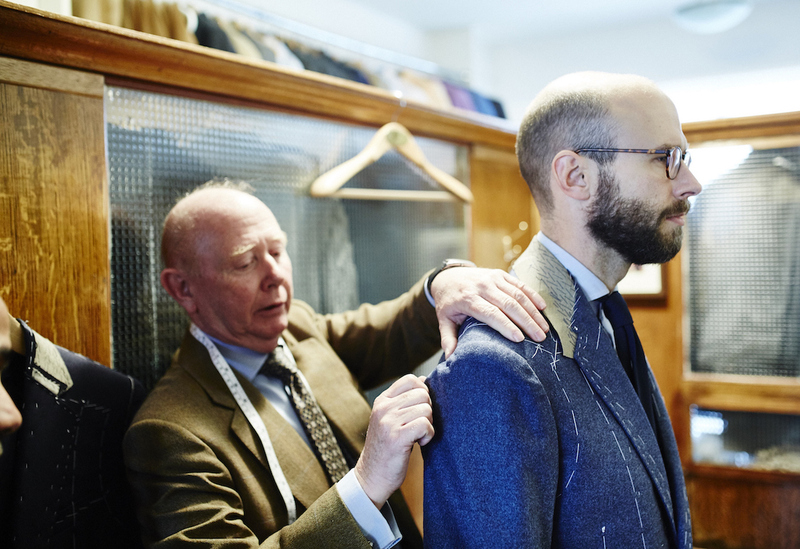 Classic Bespoke involves the suit being cut and finished by ex-Kilgour cutter John McCabe (pictured above) in London, but made by a team in India trained by Savile Row coatmaker Bob Bigg. Hence the value. Read my review of the resulting suit here. You can follow the discussion on Whitcomb & Shaftesbury visit the US by entering your email address in the box below. You will then receive an email every time a new comment is added. These will also contain a link to a page where you can stop the alerts, and remove all of your related data from the site. Does John McCabe actually travel to the U.S. though? I’m always hesitant to have a salesperson do the measuring / fitting. He travels on around half the trips – but not the next one. Classic Bespoke is now $2100 instead of £1360? That’s a big change since you last quoted the prices in October 2015. Pounds and Dollars – got to me more careful. Also, given how low the pound has been relative to the dollar recently, this is an even better deal. I commissioned a suit with W&S last week, very similar in concept to Simon’s, and was very pleased at the very pleasant reception and excellent advice and knowledge of John and Suresh. I’ve been trying to contact them to schedule an appointment when they visit New York for the past week with multiple emails to Karen with no reply and no answer at the number listed on their website. Any suggestions on how to reach them Simon? Scratch that – Karen replied literally as I was posting!